Are our schools in trouble because they have lowered their standards and strayed too far from the basics? Just the opposite: if American students are getting less than they deserve, it’s due to simplistic demands to “raise the bar” and an aggressive nostalgia for traditional teaching. Alfie Kohn, the author of critically acclaimed works on such subjects as competition and rewards, now turns the conventional wisdom about education on its head. 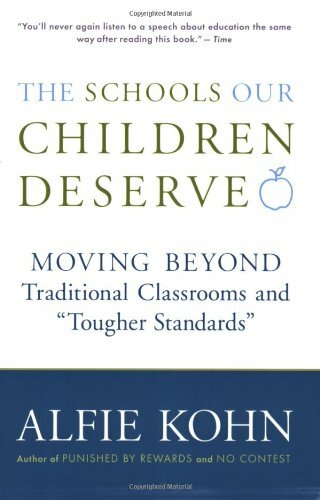 In this landmark book, he shows how the “back-to-basics” philosophy of teaching treats children as passive receptacles into which forgettable facts are poured. Likewise, shrill calls for Tougher Standards are responsible for squeezing the intellectual life out of classrooms. Such political slogans reflect a lack of understanding about how and why kids learn, and they force teachers to spend time preparing students for standardized tests instead of helping them to become critical, creative thinkers. 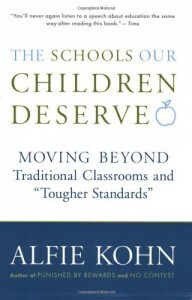 Kohn offers an ambitious yet practical vision of what our children’s classrooms could be like. Drawing on a remarkable body of research, he helps parents and other ex-students understand the need to move beyond a “bunch o’ facts” model of teaching. Drawing on stories from real classrooms, he shows how this can be done. Along the way, Kohn offers surprising truths about the Whole Language versus phonics controversy, why a straight-A report card may not be good news, and how we can best gauge the progress of schools and students. The Schools Our Children Deserve offers a fresh perspective on today’s headlines about education – and on what our children will be asked to do in class tomorrow morning. It offers a persuasive invitation to rethink our most basic assumptions about schooling. Click here for an excerpt about about the limits of fact- and skill-oriented instruction. Click here for an excerpt about teaching math. Click here for an excerpt about teaching reading. Click here for an excerpt about research on early-childhood education.